^ 1.0 1.1 1.2 1.3 1.4 1.5 1.6 1.7 1.8 Herndon D (編). Chapter 4: Prevention of Burn Injuries. Total burn care 4th. Edinburgh: Saunders. 2012: 46. ISBN 978-1-4377-2786-9. ^ 2.0 2.1 2.2 2.3 2.4 Burns. World Health Organization. September 2016 [2017-08-01]. （原始內容存檔於2017-07-21）. ^ 3.00 3.01 3.02 3.03 3.04 3.05 3.06 3.07 3.08 3.09 3.10 3.11 3.12 3.13 3.14 3.15 3.16 3.17 3.18 3.19 3.20 3.21 3.22 3.23 3.24 3.25 3.26 3.27 3.28 3.29 3.30 3.31 3.32 3.33 3.34 3.35 3.36 3.37 3.38 3.39 3.40 3.41 3.42 3.43 3.44 3.45 3.46 3.47 3.48 3.49 3.50 3.51 3.52 3.53 Tintinalli, Judith E. Emergency Medicine: A Comprehensive Study Guide (Emergency Medicine (Tintinalli)). New York: McGraw-Hill Companies. 2010: 1374–1386. ISBN 0-07-148480-9. ^ 4.0 4.1 GBD 2015 Disease and Injury Incidence and Prevalence, Collaborators. Global, regional, and national incidence, prevalence, and years lived with disability for 310 diseases and injuries, 1990–2015: a systematic analysis for the Global Burden of Disease Study 2015. Lancet. 2016-10-08, 388 (10053): 1545–1602. PMC 5055577. PMID 27733282. doi:10.1016/S0140-6736(16)31678-6. ^ 5.0 5.1 GBD 2015 Mortality and Causes of Death, Collaborators. Global, regional, and national life expectancy, all-cause mortality, and cause-specific mortality for 249 causes of death, 1980–2015: a systematic analysis for the Global Burden of Disease Study 2015. Lancet. 2016-10-08, 388 (10053): 1459–1544. PMC 5388903. PMID 27733281. doi:10.1016/S0140-6736(16)31012-1. ^ 6.00 6.01 6.02 6.03 6.04 6.05 6.06 6.07 6.08 6.09 6.10 6.11 6.12 6.13 6.14 6.15 Granger, Joyce. An Evidence-Based Approach to Pediatric Burns. Pediatric Emergency Medicine Practice. Jan 2009, 6 (1). （原始內容存檔於2013-10-17）. ^ Ferri, Fred F. Ferri's netter patient advisor 2nd. Philadelphia, PA: Saunders. 2012: 235. ISBN 9781455728268. （原始內容存檔於2016-12-21）. ^ 8.00 8.01 8.02 8.03 8.04 8.05 8.06 8.07 8.08 8.09 8.10 8.11 8.12 8.13 Herndon D (編). Chapter 3: Epidemiological, Demographic, and Outcome Characteristics of Burn Injury. Total burn care 4th. Edinburgh: Saunders. 2012: 23. ISBN 978-1-4377-2786-9. ^ Haagsma, JA; Graetz, N; Bolliger, I. The global burden of injury: incidence, mortality, disability-adjusted life years and time trends from the Global Burden of Disease study 2013.. Injury prevention : journal of the International Society for Child and Adolescent Injury Prevention. February 2016, 22 (1): 3–18. PMC 4752630. PMID 26635210. doi:10.1136/injuryprev-2015-041616. ^ Herndon D (編). Chapter 1: A Brief History of Acute Burn Care Management. Total burn care 4th. Edinburgh: Saunders. : 1. ISBN 978-1-4377-2786-9. ^ 11.0 11.1 11.2 Burn Incidence and Treatment in the United States: 2012 Fact Sheet. American Burn Association. 2012 [2013-04-20]. （原始內容存檔於2013-02-21）. ^ 12.0 12.1 12.2 12.3 12.4 12.5 12.6 12.7 12.8 12.9 Herndon D (編). Chapter 10: Evaluation of the burn wound: management decisions. Total burn care 4th. Edinburgh: Saunders. : 127. ISBN 978-1-4377-2786-9. ^ 13.00 13.01 13.02 13.03 13.04 13.05 13.06 13.07 13.08 13.09 13.10 13.11 13.12 13.13 13.14 13.15 13.16 13.17 13.18 Brunicardi, Charles. Chapter 8: Burns. Schwartz's principles of surgery 9th. New York: McGraw-Hill, Medical Pub. Division. 2010. ISBN 978-0-07-154769-7. ^ 15.0 15.1 15.2 15.3 15.4 15.5 15.6 Marx, John. Chapter 140: Electrical and Lightning Injuries. Rosen's emergency medicine : concepts and clinical practice 7th. Philadelphia: Mosby/Elsevier. 2010. ISBN 0-323-05472-2. ^ Buttaro, Terry. Primary Care: A Collaborative Practice. Elsevier Health Sciences. 2012: 236. ISBN 978-0-323-07585-5. ^ Kowalski, Caroline Bunker Rosdahl, Mary T. Textbook of basic nursing 9th. Philadelphia: Lippincott Williams & Wilkins. 2008: 1109. ISBN 978-0-7817-6521-3. ^ Peden, Margie. World report on child injury prevention. Geneva, Switzerland: World Health Organization. 2008: 86. ISBN 978-92-4-156357-4. ^ World Health Organization. World report on child injury prevention (PDF). ^ Prahlow, Joseph. Forensic pathology for police, death investigators, and forensic scientists. Totowa, N.J.: Humana. 2010: 485. ISBN 978-1-59745-404-9. ^ Kearns RD, Cairns CB, Holmes JH, Rich PB, Cairns BA. 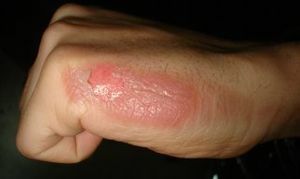 Thermal burn care: a review of best practices. What should prehospital providers do for these patients?. EMS World. January 2013, 42 (1): 43–51. PMID 23393776. ^ 32.0 32.1 Marx, John. Chapter 144: Radiation Injuries. Rosen's emergency medicine: concepts and clinical practice 7th. Philadelphia: Mosby/Elsevier. 2010. ISBN 0-323-05472-2. ^ 33.0 33.1 Krieger, John. Clinical environmental health and toxic exposures 2nd. Philadelphia, Pa. [u.a. ]: Lippincott Williams & Wilkins. 2001: 205. ISBN 978-0-683-08027-8. ^ 35.0 35.1 Herndon D (編). Chapter 61: Intential burn injuries. Total burn care 4th. Edinburgh: Saunders. : 689-698. ISBN 978-1-4377-2786-9. ^ Peden, Margie. World report on child injury prevention. Geneva, Switzerland: World Health Organization. 2008: 82. ISBN 978-92-4-156357-4. ^ 38.0 38.1 38.2 38.3 38.4 38.5 38.6 38.7 38.8 Marx, John. Chapter 60: Thermal Burns. Rosen's emergency medicine concepts and clinical practice 7th. Philadelphia: Mosby/Elsevier. 2010. ISBN 978-0-323-05472-0. ^ 39.0 39.1 39.2 39.3 39.4 Rojas Y, Finnerty CC, Radhakrishnan RS, Herndon DN. Burns: an update on current pharmacotherapy. Expert Opin Pharmacother. December 2012, 13 (17): 2485–94. PMC 3576016. PMID 23121414. doi:10.1517/14656566.2012.738195. ^ Hannon, Ruth. Porth pathophysiology : concepts of altered health states 1st Canadian. Philadelphia, PA: Wolters Kluwer Health/Lippincott Williams & Wilkins. 2010: 1516. ISBN 978-1-60547-781-7. ^ 41.0 41.1 41.2 41.3 Garmel, edited by S.V. Mahadevan, Gus M. An introduction to clinical emergency medicine 2nd. Cambridge: Cambridge University Press. 2012: 216–219. ISBN 978-0-521-74776-9. ^ Jeschke, Marc. Handbook of Burns Volume 1: Acute Burn Care. Springer. 2012: 46. ISBN 978-3-7091-0348-7. ^ Klingensmith M (編). The Washington manual of surgery 5th. Philadelphia, Pa.: Lippincott Williams & Wilkins. 2007: 422. ISBN 978-0-7817-7447-5. ^ Jeschke, Marc. Handbook of Burns Volume 1: Acute Burn Care. Springer. 2012: 77. ISBN 978-3-7091-0348-7. ^ 52.0 52.1 Wasiak J, Cleland H, Campbell F. Wasiak, Jason, 編. Dressings for superficial and partial thickness burns. Cochrane Database Syst Rev. 2008, (4): CD002106. PMID 18843629. doi:10.1002/14651858.CD002106.pub3. ^ 53.0 53.1 53.2 Avni T, Levcovich A, Ad-El DD, Leibovici L, Paul M. Prophylactic antibiotics for burns patients: systematic review and meta-analysis. BMJ. 2010, 340: c241. PMC 2822136. PMID 20156911. doi:10.1136/bmj.c241. ^ 57.0 57.1 Herndon D (編). Chapter 64: Management of pain and other discomforts in burned patients. Total burn care 4th. Edinburgh: Saunders. : 726. ISBN 978-1-4377-2786-9. ^ Herndon D (編). Chapter 31: Etiology and prevention of multisystem organ failure. Total burn care 4th. Edinburgh: Saunders. : 664. ISBN 978-1-4377-2786-9. ^ Jeschke, Marc. Handbook of Burns Volume 1: Acute Burn Care. Springer. 2012: 266. ISBN 978-3-7091-0348-7. ^ Jull AB, Rodgers A, Walker N. Jull, Andrew B, 編. Honey as a topical treatment for wounds. Cochrane Database Syst Rev. 2008, (4): CD005083. PMID 18843679. doi:10.1002/14651858.CD005083.pub2. ^ Young, Christopher King, Fred M. Henretig (編). Textbook of pediatric emergency procedures 2nd. Philadelphia: Wolters Kluwer Health/Lippincott Williams & Wilkins. 2008: 1077. ISBN 978-0-7817-5386-9. ^ 69.0 69.1 Roberts, edited by Michael C. Handbook of pediatric psychology. 4th. New York: Guilford. 2009: 421. ISBN 978-1-60918-175-8. ^ WHO Disease and injury country estimates. World Health Organization. 2009 [2009-11-11]. ^ Gupta. Textbook of Surgery. Jaypee Brothers Publishers. 2003: 42. ISBN 978-81-7179-965-7. ^ 74.0 74.1 74.2 74.3 74.4 74.5 74.6 74.7 Herndon D (編). Chapter 1: A Brief History of Acute Burn Care Management. Total burn care 4th. Edinburgh: Saunders. : 1. ISBN 978-1-4377-2786-9. ^ Wylock, Paul. The life and times of Guillaume Dupuytren, 1777-1835. Brussels: Brussels University Press. 2010: 60. ISBN 9789054875727. National Burn Repository (PDF). American Burn Association. 2012. （原始內容 (PDF)存檔於2013-10-19）.